bl.uk > Online Gallery Home	> Online exhibitions	> Asia, Pacific and Africa Collections	> Karachi Bunder view. 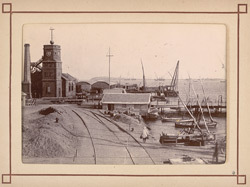 Photograph with a view along the waterfront looking towards the Time-Ball tower at Karachi, taken by an unknown photographer, c.1900, part of an album titled Karachi Views. Karachi, now the capital of the Sindh province in the lower Indus valley, was once the capital of Pakistan and continues to be the country's commercial hub and largest city. Its history prior to the 19th century is largely unrecorded but it is believed to be the ancient port of Krokala on the Arabian Sea, visited by Alexander's admirals in 326 BC. It consisted largely of small fishing villages until the rulers of Sindh built a small port of Kharak Bunder, and a mud fort here, and made it a trading centre in the 18th century. Its harbour was developed by the British after they conquered Sindh in the mid 19th century, due to an increase in the number of ships from international ports carrying goods to and from the sub-continent; cotton and wheat were particularly important commodities. The Time-Ball was a signalling device whereby a ball dropped in a given time and enabled captains of ships docked in the harbour to test the accuracy of their chronometers.